Yesterday I wanted a strawberry pina colada type smoothie so I opened up my can of pineapples and added it into my usual base. You know the milk, yogurt base (the recipe is written under Smoothie kick post.) I made it twice once with regular milk once with coconut milk. Anyway, I’ve had a bad headache all day and wasn’t even thinking about the possibility or curdling my milk. Guess, what happened. As I was drinking it, I thought… “ok this isn’t too bad in the flavor department, not one of my best though.” Then as I got to the bottom of it, it got slightly foamy and a little grainy in the texture department. Still totally drinkable, and if I hadn’t known the ingredients I wouldn’t have noticed, but I was so worried while I was drinking it, so any slight change I was aware of. I guess it just mentally weirded me out. Lesson of the day is no milk and pineapple. If I were to make this again, I would probably only use the juice from the pineapple can or only yogurt. Im a texture freak and I cant stand grainy food. Let me know if you’ve had better luck mixing pineapple and milk. Side note: I used canned pineapple. I recommend cutting these into bits and freezing them because it releases a lot of liquid into your smoothie if its not frozen. Back to the good stuff! I bought a blender a couple days ago. Now, they only sell blenders with glass pitchers over here. I was irritated because I was going to have to carry it. After using this blender though… I have to say glass pitchers are awesome and I’m glad I dragged the thing home. ( I found out the reason for the glass, apparently years ago there was a scare with plastic. It was leaking some kind of toxic something, so that is why blenders are primarily glass in Japan now). So, now that I had my blender I went to the grocery store that sells bulk foods designed for restaurants. I figured I’d get more bang for my buck when buying frozen food. I picked up frozen strawberries and mango, fresh spinach, milk, and yogurt. I also bought various canned fruits to experiment with. I did not go anywhere near the blueberries!! 600円 ($7.66) for one small frozen pack of blueberries?!? i don’t think so! So with my heavy glass blender in hand and my heavy grocery bag full of goodies I headed home. Side note: I lost some weight recently and all my protective fat in my shoulder area is gone. I was really feeling the weight of my grocery bag… ouch! I get home and the first smoothie I whip up was for me and a friend. I added coconut milk, strawberries and mango. It was delish! The next day I decided to do something a bit healthier. 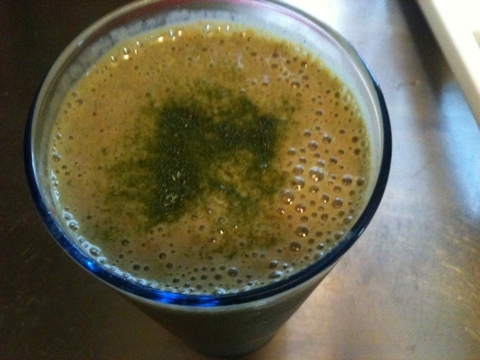 I decided to make a matcha strawberry honey and spinach smoothie. This mix may sound weird but man oh man is it delicious! 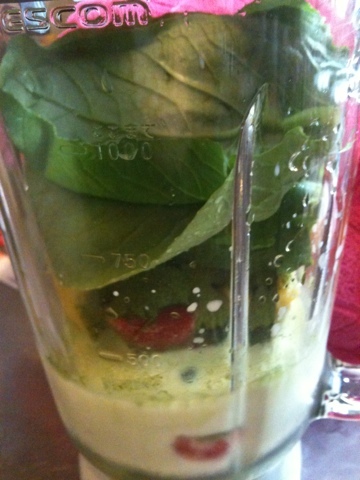 I promise you, you can’t taste the spinach but it adds a really healthy element to your smoothie! I have a low iron count so this is a good way to get my dark leafy greens into my diet. Also matcha is green tea so it’s a good way to intigrate those anti-oxidents we keep hearing about! Day three of my smoothie making and I made my matcha strawberry smoothie but i added some frozen mango. BINGO! This is the final product! Keep in mind I just eyeballed everything but here is the recipe if I had to add measurements. These are not exact, so tweak it yourself! In a blender, add in order of ingredients! Start with liquids, milk, yogurt, strawberries, mangos, matcha, honey and spinach at the top. Always add fresh ingredients at the top. Always add liquids at the bottom, this will help your blender process everything! Make sure you don’t over-blend, this can affect the quality of your smoothie! Let me know what you think! The good, the bad, ugly! I want to know! So, I’ve been looking for a new technique to try out on my nails and came across water marbling. At first I wasn’t really sure how the colors would turn out if they are diluted in water but it turns out really nice. It’s a lot simpler than i thought it would be. Some things I discovered the hard way… use bottled water, the first color add 2 drops and don’t forget to shake your nail in the water to get rid of any surface bubbles. Also, I did one hand at once. I didn’t want to waste polish because I use OPI and in Japan is $25 a bottle. I get all mine from the US but still waste not want not! the bigger the bullseye the stronger the color turns out. On the multi color one I did if you look at my middle finger its a bit lighter then the other nails. thats cause the first time i only did the colors twice in the bullseye. The other nails I layered them three times. So if you want a more opaque look… layer more in the bullseye! 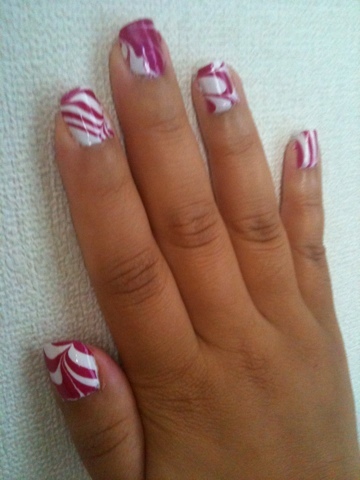 Check out my other nail posts!